Take the TelefériQo up Pichincha and then go hiking. To do this, you’ll need: a waterproof jacket, layers, good hiking boots, sunscreen, snacks, and plenty of water. Also suggested: sunglasses, gloves, friendly companions, strong lungs, and an early morning visit (to avoid the clouds). Cost to ride the TelefériQo is $7.50 per person (tourist price). 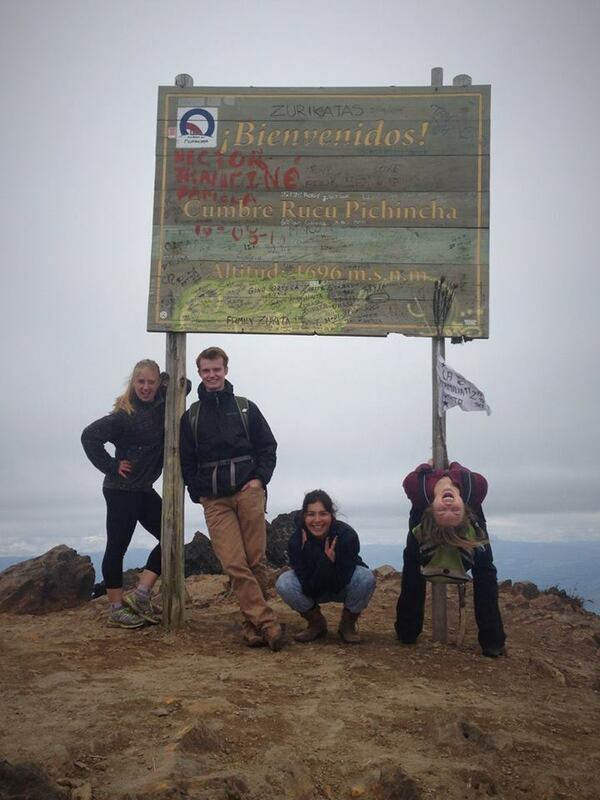 At the peak of Rucu Pichincha. Photo credit: Aimee Hoffman. Visit El Centro Histórico. This is basically the old Quito, so it’s full of Spanish architecture, big churches, museums, parks, restaurants, and so much more! This is definitely a good place to visit if you like to roam around old places. Still, most of this part of town has been updated, so you’ll see a lot of modern things mixed in with the old. 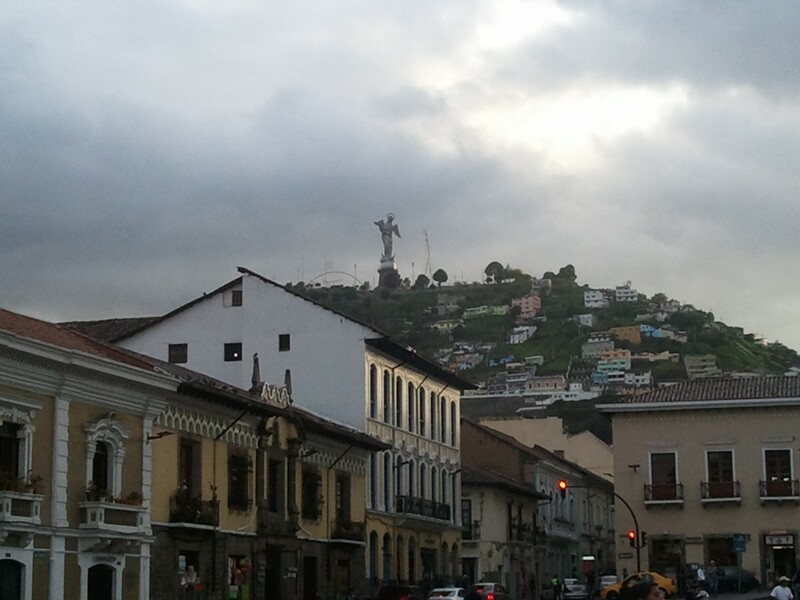 You can also visit El Panecillo, a hill with a giant statue of La Virgen del Panecillo. Walking through El Centro Histórico and seeing La Virgen del Panecillo. Go to a museum. To really learn about the history of Quito or Ecuador, you must visit a museum to experience the past. Two of my favorite museums in Quito (also located in El Centro Histórico) are Museo de la Ciudad and Museo El Alabado. The first has detailed exhibits of the effects of the Spanish Conquista and the second is full of Pre-Incan and Post-Incan art. Plus, they are only a few blocks away from each other! 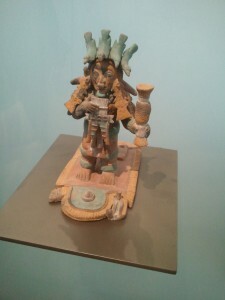 Ceramic artwork displaying the clothing of a shaman found at Museo El Alabado. Eat good food. It’s Ecuador, so the food here is delicious anyway. But since this is Quito, the capital, there are a variety of tasty restaurants from all over. If you want to try some Cuban, Spanish, Chinese, Mexican, or any other country’s food, you’ll likely find a restaurant for it in Quito. The restaurants are located all throughout the city. There is also street food (not recommended for travelers) sold all over Quito. Plus, if you’re craving good ol’ American food, there are tons of American chains here including Subway, Domino’s, Burger King, McDonald’s, and KFC (although their menus have some Ecuadorian twists to them!). Watch a play. There are always shows at La Casa de la Cultura and El Patio de las Comedias. I’m not much of a theater-geek, but I did enjoy watching a play with one of my friends at El Patio de las Comedias. It turned out to be a very popular show since it was a comedy about Cupid’s love life! My only recommendation is to buy a ticket in advance (online) or show up early to buy one (I almost didn’t get a seat). Visit a park. There are tons of parks to visit in Quito. So far I’ve only visited one, Parque La Carolina, since it’s large and close to my school. At La Carolina, there are lots of trees, places to play different sports, a skate park, and a playground. There are also free Zumba classes at La Carolina on Sunday mornings. Safety tip: never visit parks alone or after it gets dark. 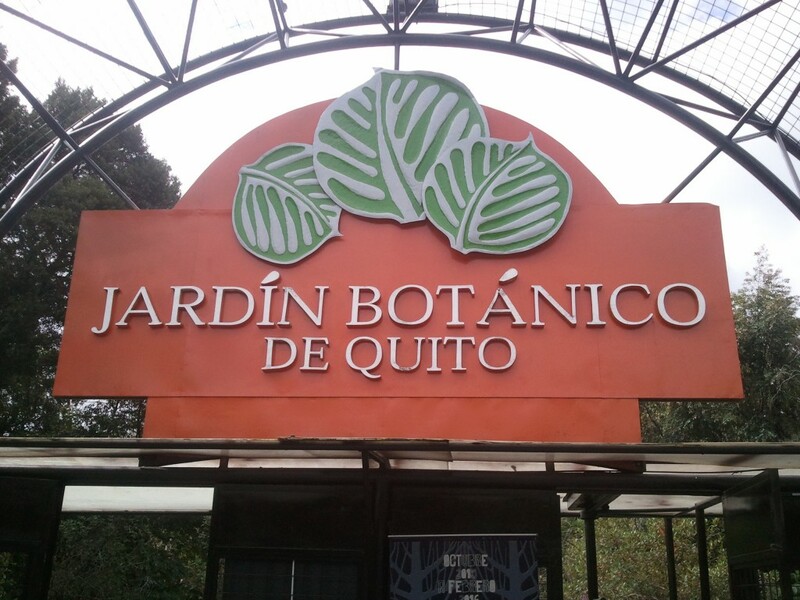 The botanical gardens in Quito are also found in La Carolina! Take a peek inside the churches. 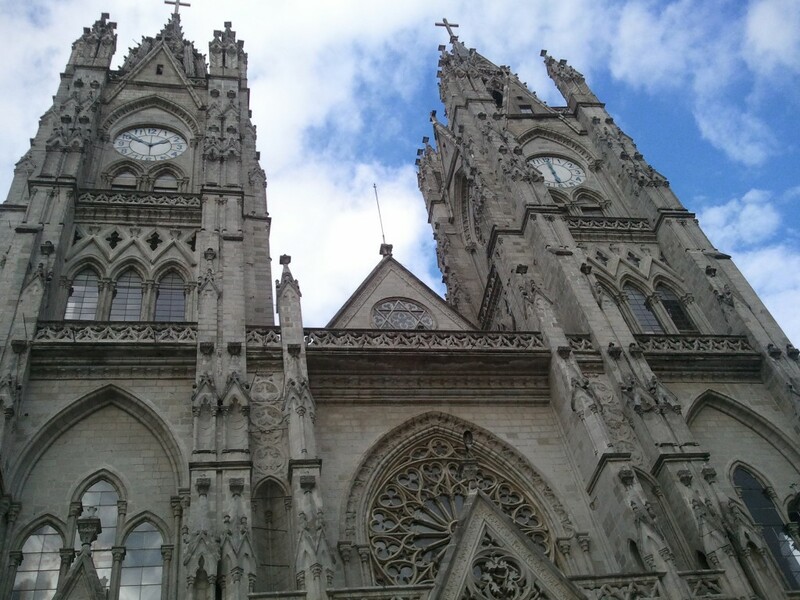 There are many churches in Quito since the city has a strong Catholic background. 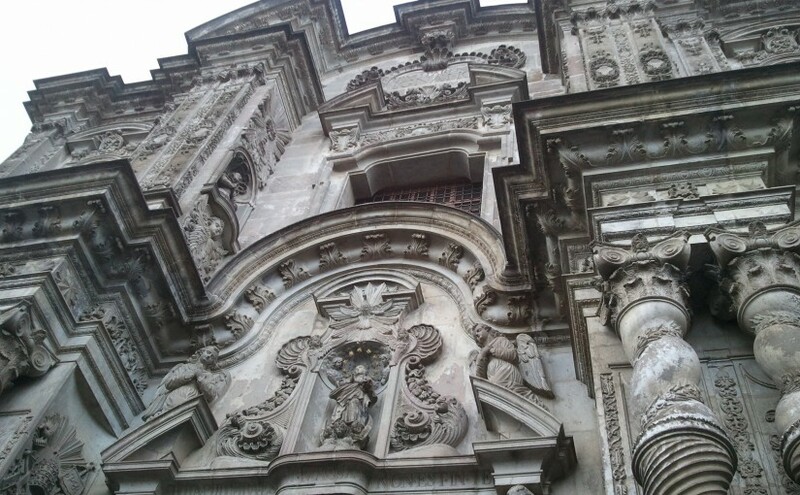 But I think the most beautiful churches are located in El Centro Histórico. Two churches that are a must-see are the Basílica del Voto Nacional which has so much beauty inside and out (and it’s HUGE), and the other is La Compañia de Jesús which is adorned with gold inside. The entire church was impossible for me to capture with my camera! This is La Basílica. Go to a fútbol game. This is still on my to-do list. A really popular place to watch professional soccer games is at El Estadio Olímpico Atahualpa located in the northern part of Quito. When I get the chance to attend a game, I’ll, of course, have to buy an Ecuadorian t-shirt to support my host country’s team! Attend a concert. It doesn’t have to be a big concert; Quito has tons of mini-concerts every week. Some places have jazz, rock, and Latin music. Most of the mini-concerts are found within local pubs or breweries. But, Quito also has big concerts! On March 3rd, I’ll be attending an Enrique Iglesias concert at El Coliseo General Rumiñahui! I’m so excited (I’ll mention it in a future blog, I’m sure)! Learn to dance. Or if you already know how to dance, then just find an awesome discoteca to go dancing. Like I mentioned before, there are free Zumba classes in the park. There are also a few places I’ve seen where they teach belly dancing! I haven’t personally tried those classes, but what I have done is learn to dance from a native. To do this, go to any club that plays Latin music (my favorite), start dancing with friends, and, sure enough, a native will want to dance with you! So there’s a short list of a variety of activities to partake in when you visit Quito, and I hope you do! Till my next blog, ¡ciao, amigos!